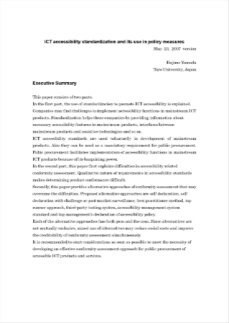 In this 2007 paper, the author argues that with ageing populations there is an increasing need for ICT accessibility, and presents examples from Japan and the United States. Early work in this area is described. This includes the work of standards committees and their working groups that considered and discussed options for implementing accessibility standards (including voluntary adoption and compliance mechanisms). The other resources in this section of the G3ict Accessible Procurement Portal were preceded by research into the practices and related needs of inclusive public procurement throughout the World. In the 1990s and 2000s, Information and Communications Technology (ICT) work had primarily focused on the design of interfaces for use by people with disabilites. Starting around the mid-2000s, more and more focus was placed on the activities that support and drive the need for accessible technologies in companies, government entities, and other organizations. For those who are interested in the work that helped form the foundations of the model ICT policy, we have included this resource as additional background information.